We’re proud to announce ATOMI, the revolutionary multi axis drive for CNC applications. It is a closed loop stepper drive that essentially turns stepping motors into servo motors. 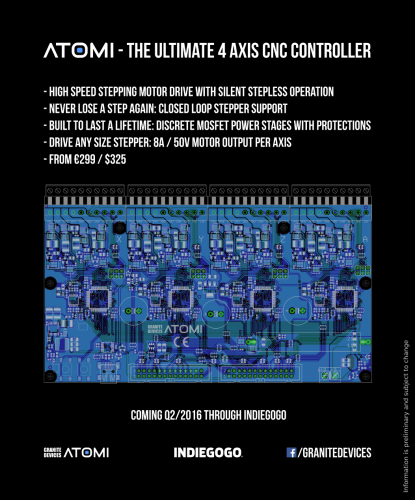 ATOMI gives the benefits of both worlds: reliability of servos and high torque of steppers. 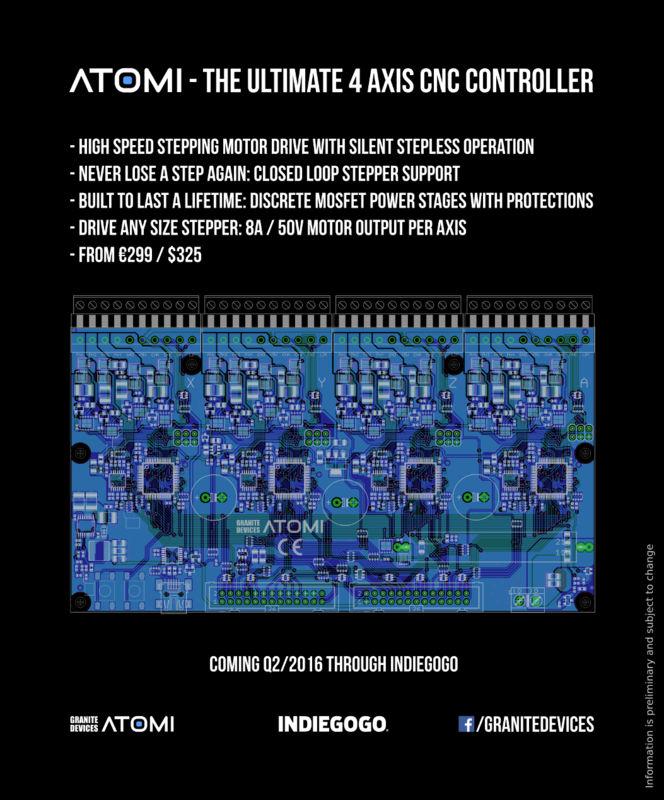 ATOMI will be launched in the Indiegogo on Q2/2016. Stay tuned and grab the early bird specials! Ps. it is largely based on IONI technology. IONI Pro will get all the same features than ATOMI through firmware upgrades. This entry was posted in Announcement, Atomi, General, Hardware by Tero. Bookmark the permalink. How do you add encoders or positional feedback to the steppers? It’s easy if you have dual shaft stepper where rear shaft can be used for encoder like CUI AMT102. The other choice is to use stepper with built-in encoder. We plan to add such motors in stock with the ATOMI. Tero, thanks for pointing out those CUI units. I was not aware of them, and their pricing is great! I am very curious about your success with using back EMF feedback for sensorless stepper motors. I found this page searching the web for “sensorless stepper closed loop”. The only commercially available drive seems to be from Nanotec (https://youtu.be/pRljKJFpcvw, although it is a little unclear which of their controllers actually support this mode of operation). In short, steppers seem to need higher resolution encoders than regular servos, because the poles are much closer together. Once that was done, I had a nice 4 phase servo running. Could it be that you continue also IONIZER project again? It would be wonderful. Greetings and a happy rest of 2016! Thanks for feedback :) If we continue IONIZER, it would be rather based on a control module that allows reduction of external components instead of IONI drive. Time will tell. Also, EtherCAT support is on the way! It will be a converter board between EC and SimpleMotion so all current drives will work on it. Based on my study of torque curves, I would say that driving steppers as high pole count servos improves the torque curve (basically the torque curve becomes flatter, giving you more torque at higher speeds), but it does not magically give them the same characteristics as a typical low pole count servo drive. Stepper motor torque loss at higher speeds can be a serious problem. I recently had to cut the maximum speed of a stepper motor in half because it wasn’t reliably producing enough torque at those higher speeds. Unfortunately, I couldn’t run it as a servo because it doesn’t have a motor-mounted encoder. Sensorless control for stepper speed should be possible, since it’s become routine for servo speed control, but for position control, you still have to figure out how to handle accurately keeping track of position. Well, using closed loop mode doesn’t increase stepper torque a bit (unless you configure higher current, which you could do as it runs cooler). But closed loop allows you taking 100% out of motor torque without risk of stalling. In open loop mode you need some 30-50% margin to avoid stalling so motor appears lower torque. But it is true that max speed of stepper will usually be less than servo motor even in closed loop mode. Many steppers seem to run cloesd loop ~1.5-2krpm at 48V which is sufficient for most apps. Sensorless operations should be definitely possible. I’ve already experimented with sensorless angle sensing algorithm for stepper and it seems to work quite nicely. It takes lots of more R&D to get some real results. Great product. And thank you for the EtherCAT! Do you have any news about EtherCat board?